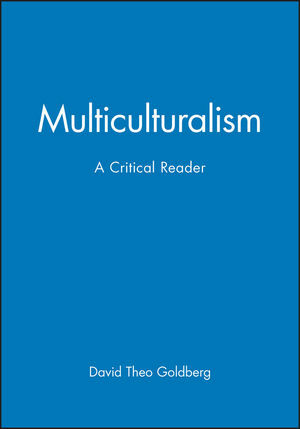 Multiculturalism: A Critical Reader delineates the prevailing concerns and considerations, principles and practices, concepts and categories that fall under the rubric of "multiculturalism". David Theo Goldberg teaches in the School of Justice Studies of Arizona State University. His Racist Culture: Philosophy and the Politics of Meaning (1993) is also available from Blackwell Publishers. Introduction: Multicultural Conditions (David Theo Goldberg). Part I: Thinking the Unthinkable: Setting Agendas. 1. White Terror and Oppositional Agency: Towards a Critical Multiculturalism (Peter McLaren). 2. The Politics of recognition (Charles Taylor). 3. Introduction to "Critical Multiculturalism" (Lauren Berlant and Michael Warner). 4. Critical Multiculturalism (Chicago Cultural Studies Group). 5. Diversity's Diversity (Judith Stiehm). 6. Ethnic Studies: Its Evolution in American colleges and Universities (Ramon A. Gutierrez). 7. Diminishing Returns: Can Black Feminism(s) Survive the Academy (Barbara Christian). 8. On being a Role Model (Anita L. Allen). Part II: breaking the Bounds of Disciplines. 9. Goodbye, Columbus? Notes on the Culture of Criticism (Henry Louis Gates JR.). 10. Essentialism and the Complexities of Racial Identity (Michael Eric Dyson). 11. Black Vernacular Representation and Cultural Malpractice (Tommy L. Lott). 12. The Search for the "Good Enough" Mammy: Multiculturalism, Popular Culture, and Psychoanalysis (Michele Wallace). 13. "Chicana! Rican? No, Chicana-Riquena!" Refashioning the Transnational Connection (Angie Chabram Dernersesian). 14. Contested Histories: Eurocentrism, Multiculturalism, and the Media (Robert Stam and Ella Shohat). 15. Insurgent Multiculturalism and the Promise of Pedagogy (Henry E. Giroux). 16. Is Science Multicultural? Challenges, resources, Opportunities, Uncertainties (Sandra Harding). 17. Identity: Cultural, Transcultural, and Multicultural (Peter Caws). 18. Ota Benga's Flight Through Geronimo's Eyes: Tales of Science and Multiculturalism (Cedric Robinson). 19. Anthropology and Multiculturalism: What Is Anthropology that Multiculturalists Should Be Mindful of It (Terence Turner).